The capital of the Chilean part of Tierra del Fuego is Porvenir, 34km across the Magellan Strait from Punta Arenas. The port the ferry departs from is slightly to the north of the city. It’s an easy enough crossing on a comfortable, modern ferry (where all the signs are in Greek, oddly enough! ), which takes just under 2 hours. 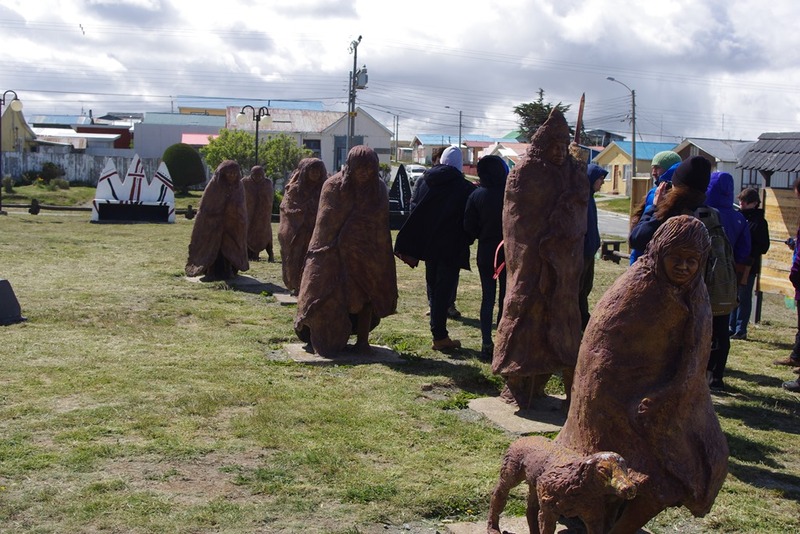 Once we arrived in Porvenir, the first stop was at a frankly rather tacky monument to the indigenous Selknam people, before we went to the museum to learn more about them. This wasn’t a comfortable story. We learnt all about how European settlers had committed genocide against the population in the late nineteeth century, and how – in their attempts to save the survivors – the Catholic Church inadvertently contributed to killing the remaining people of this race. An entire native population is now considered extinct, as is their language. It’s a fascinating and horrific history that I was completely ignorant of. 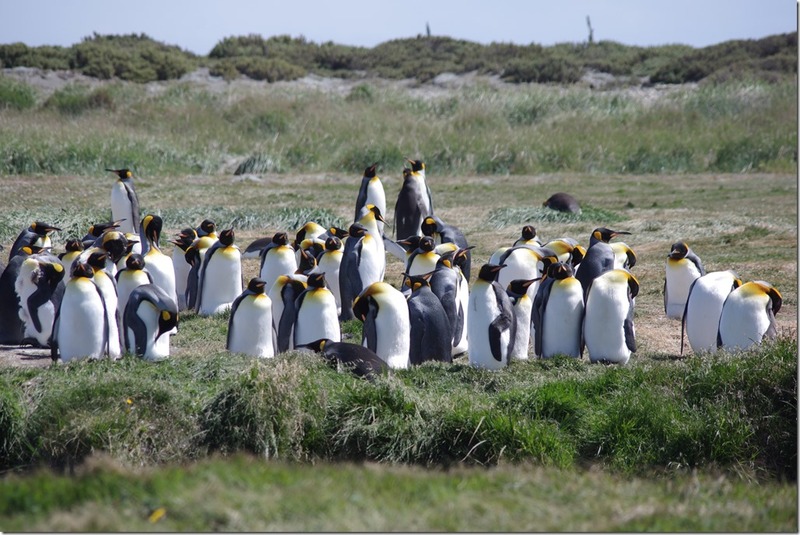 After that hard morning, we drove for about 90 minutes to reach a group of King Penguins. This species had been resident on Tierra del Fuego until about 500 years ago, and then had become constrained to just the Falkland and Sound Georgia Islands. About five years ago, however, a group of penguins returned to Tierra del Fuego, and they have been joined by more since. Today, there are about 100 of them. Luckily, the ranch owners where the penguins came ashore were quick to protect them and there are now scientific research projects monitoring their progress. Undoubtedly, the ranch owners also saw the other benefit of getting extra income from tourism, which the 12,000CLP (£12) site entrance fee certainly exploits! You’ll notice I’ve been careful to call the penguins a ‘group’ and not a ‘colony’. Apparently, to be a colony, they have to be established in the same place for at least three generations. The sole surviving chick that was born on Tierra del Fuego is now about to reach maturity, so (with penguins’ slow breeding cycle) it will take about another 15 years before they are technically a ‘colony’. Regardless, it was great to spend about 45 minutes with these fascinating and funny animals, despite the bitterly cold wind. I was very glad I’d brought my telephoto lens, though, as we were kept behind wooden barriers, probably about 30 metres away from the birds, so as not to disturb them. I think those taking photos just on their mobile phones were disappointed. Once we left the penguins, it was another 90 minute drive to the northern coast of the island to return to the mainland. This was a different route from the one we had arrived on as he ferry directly back to Punta Arenas from Porvenir (on the west coast) had already departed. I’m glad we did take the excursion, though, as an orca swam alongside our ferry for part of the journey back. Unlike my previous attempts with dolphins, I was able to get the orca on video, albeit for only a second or so, before it disappeared underwater. There were a couple less pretty, more mundane, things I noticed on our return drive to Punta Arenas (which took another 2 hours). The first was minefields. I’d read before coming that there are some uncleared minefields that still exist in Chile, mainly in the far north and far south of the country. They were planted as part of Pinochet’s attempts to secure the Chilean border. This road (Road 255) had the first marked minefields I had seen, though. The other thing I noticed was the telegraph poles. Nothing special about that, you might think, except that every fifth pole seemed to have a coil of wire attached to it, which seemed odd. My guess is that, in a region that’s so remote yet suffers from regular high winds, poles falling over is a fairly common occurrence, and they might not be attended to quickly. I imagine that when this happens, the coils of wire are designed to unwind, ensuring that communication is kept even when the poles are on the ground. I haven’t corroborated this but it seems a reasonable explanation. Perhaps the most notable thing about the return (other than the orca), though, was the weather. I’d said how bitterly cold the wind was when I was in Punta Arenas in my previous post. Well, it was worse today. Much to the surprise of our local guides (who assure us that the temperature should be at least 12C by now in late spring), it was just 2C in places today. A couple times on the road we had sleet, and at one point it even started to show signs of trying to settle as snow. This is apparently exceptional, and may be related to the ongoing strong El Niño in the Pacific. The final stop on the trip was to Estancia San Gregorio. This had been the first ranch in the area, back in the 1870s. As the gold rush of the 1850s was coming to an end, and people needed other jobs, they set up huge ranches such as this, which essentially had all the facilities of a village, including shop and church, for example. From 1945, petroleum was found in the area and so some of those ranches closed as people we re-employed. 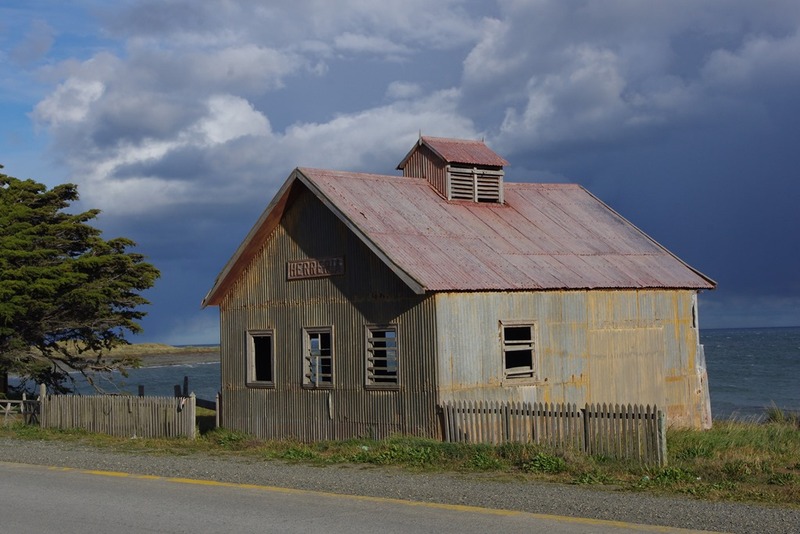 Still today, the top two industries in Tierra del Fuego are, in order, petrol and sheep farming. (Sheep had been introduced by the Europeans, and are part of the reason for the demise of the Selknam). Estancia San Gregorio is now a ghost town, with buildings looking as though they’ve been taken from a Western movie. Regrettably, we only had five minutes here to take photographs. I’d have liked to have had the opportunity to stay a little longer as it’s a fascinating place. Overall, yes. I think I got more out of it than I would have had I followed my original plan of just doing radio for a couple of hours. I wouldn’t have seen the penguins and orca for a start. Having said that, it is an expensive excursion for what it is. Inclusive of the £12 penguin entrance fee, the trip cost £60. Given that about five hours of the day were spent driving, that’s quite a bit of money. And this is as far south as I’ll go on this trip. I’ve travelled from Iquique at 20°S to Porvenir at 53°S. To put that in European, northern-hemisphere terms, it’s the equivalent of a journey from central Mali to Boston, Lincs. in the UK. And there’s more of Chile yet to go: I could go further towards Antarctica, towards the settlements of Puerto Williams and Puerto Navarino but it either involves an incredibly expensive airfare or a 30-hour+ boat trip. And once you’re there, there’s no guaranteed return date because the weather is so unreliable. So instead, I’m going to escape the cold. Tomorrow I fly north to Santiago (where it’s currently 30C, not 2C) and I’ll spend the fourth and final leg of my journey around the capital.